A community that values and embraces all young people while addressing harm together. To create opportunities for reflection, connection, & empowerment for teens, victims, and families in the Flathead Valley. The Center for Restorative Youth Justice aims to provide our community’s most vulnerable and disadvantaged youth with access to healthy and productive futures. CRYJ creates the opportunity for dialogue between victims, youth offenders & community volunteers – encouraging and supporting youth to take accountability for their actions while developing important skills and resiliencies. We believe all youth are an important and integral part of our community, and build our programming with a strong dedication and commitment those youth and victims who are in greatest need of hope and connection. By providing an integration of restorative programming models, we combine service-based activities, life skill workshops, and high levels of individualized adult and peer support to help youth find their strengths and move out of cycles of harm, incarceration, poverty, violence, and a lack of connection to school and community. We have worked with more than 1700 Flathead Valley youth since 2009, and continue to offer services to all youth in need. We are based in Kalispell, Montana and work with agencies, institutions and individuals around the nation to promote restorative responses to community harm. CRYJ began in 1998 - in its foundational form of Flathead County Peer Court. It was a small organization, with 2 staff housed in a tiny corner office within the KM Building in downtown Kalispell. In the process of creating an alternative form of meaningful justice for youth engaged in the justice system in the Flathead, we created a community of youth, volunteers, and staff that bridged social and economic differences, emphasized respect and listening, and modeled a restorative model of addressing differences and harm. As the work advanced, so did our community. In 2005, the agency shifted programming options to align more fully with the restorative justice philosophy - adding the Victim Offender Conferencing (VOC) to its accountability programming. 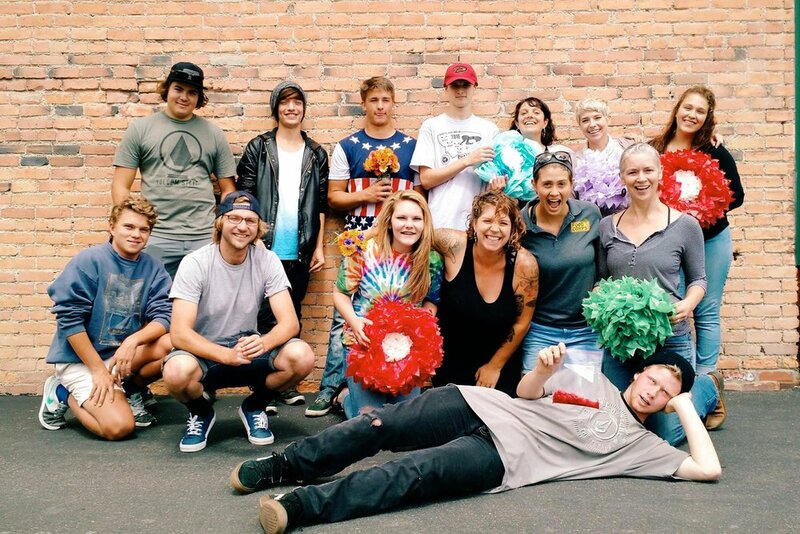 The following year, the agency again expanded its programming to include Youth Connections (YC), which provides competency development and community service opportunities to youth across Flathead County - largely in response to a shift in leadership and funding at Juvenile probation which removed the compliance monitoring and in-house community service. "Peer Court" officially changes its name to the Center for Restorative Youth Justice on March 15, 2007 to better reflect its composition as an umbrella organization supporting the not only the Peer Court program, but also the Victim Offender Conferencing and Youth Connections programs. We continued to grow - at first through the development of new programs and models, pulling heavy influence and inspiration from restorative justice programs in other communities around the nation. CRYJ developed the Drug and Alcohol Accountability Program (DAAP) in 2008, the Community Accountability Board (CAB) in 2009 and the Theft Impact Circle (TIC) in 2010. Additionally, CRYJ has expanded the agency’s focus to victims’ needs with the creation of the Victim Impact Program (VIP) in 2009, and to respond to families through an integrated conflict resolution model through the Family Conflict Resolution Program (FCRP) in 2011. Over the years working in this community, and as a close partner with the juvenile justice system - it became apparent the great need that exists to expand the historical limitations of CRYJ’s programming to shift away from an ‘offense’-based referral system into a model that would be effective in meeting the needs of youth both inside of and outside of the juvenile justice system. In January of 2015, CRYJ streamlined services to provide both a cost effective and community-oriented restorative programming model based in the power of Community Talking Circles. Through this transformation - the Community Impact Circle was born, and CRYJ shifted from an offense-based model to a ‘need’ based model; opening programming to be able to serve both youth and families in need of support, connection, alternative accountability options, or restorative dialogue. The Community Impact Circle essential replaced the former programming models - serving as a ‘first touch point’ for all youth referred to CRYJ. As TIC, DAAP, and CAB were absorbed within the Community Impact Circle - individualized intake processes and reflection projects/workshops were created to ensure that education and accountability elements encouraged by juvenile probation or court-referring processes were maintained/enhanced. In response to the needs and requests of our youth - the Trellis Project expands to provide meaningful and marketable job & life skills development. Through the Trellis Project youth have the opportunity to learn important skill-sets that carry into the culinary/food services & working world. Youth participants not only learn where food comes from but are actively involved in designing, planting, growing, maintaining, harvesting, selling, and creating healthy meals from the organic produce.